Fresh beef with pumpkin, buckwheat, chard & rosemary. Superpremium formula for puppies 3–24 months and junior dogs of large breeds above 25 kg. Holistic dog food made with 40% carefully processed fresh meat. Complete food for dogs. May be served dry or moistened with lukewarm water. Recommended daily food intake shown in a feeding table should be divided into 2-3 equal portions during the day. The recommended daily amount is shown in the feeding table. 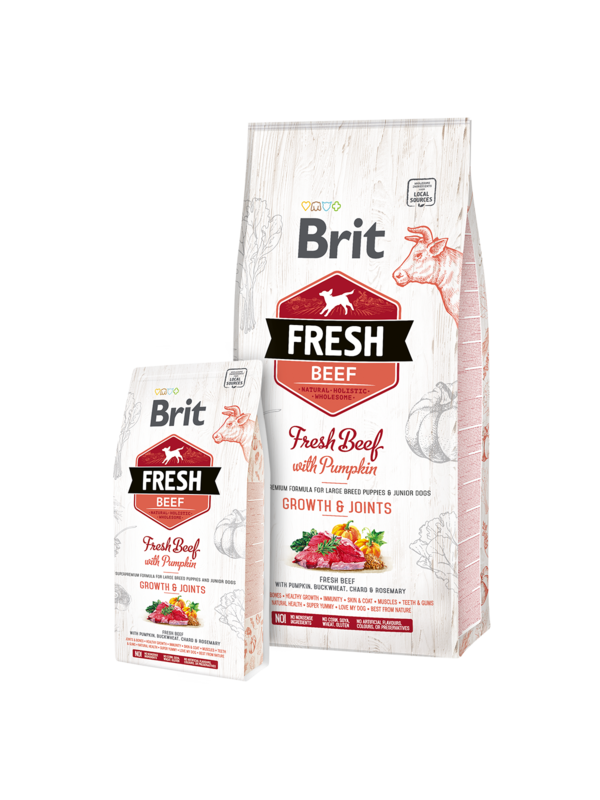 When serving Brit Fresh for first time, use smaller amounts and mix it with previous food and gradually increasing the portion of Brit Fresh. Always make sure your dog has plenty of fresh water. Always make sure your dog has plenty of fresh water. Best use before the date shown on the package. Keep in a dry and cool place, avoid direct sunlight. Reseal after opening.